This man had strong Mogolian fold and therefore his inner corner was tilted and closed. His folds of on the right eye (left on the photo) is more robust and gives more riveting look. His Mongolian fold is dragged down very strongly and this is the most difficult case to do epicnthoplasty. Inner corner of the eyes can go back to natural and horizontal way, when the tension surrounding inner corner skin and strong fibrous band are all relesed. In this specific case, muscle of inner corner is severely directed downward and can cause more complicated operation. Epicanthic eyes, head broken off in the direction of the medial canthal ligament is severely down if the preoperative appearance that looks like the eye above, and if, in some cases, the medial canthal ligament, including the intricately molded to be. 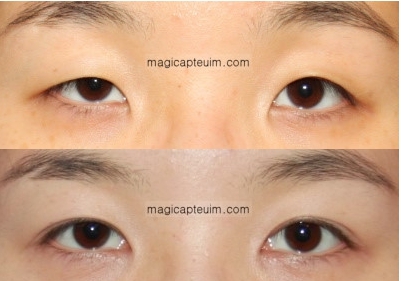 The direction of inner corner of the eyes and the level and amount of Mongolian fold is very various. So in order to get the best result from surgery, close diagnosis of the mongolian fold and the double eyelid line and the bone structure before the operation is very important. Epicanthoplasty cannot be performed in the same way to everyone because every eye has its own originality. So the operation should be held by a surgeon who has delicate surgical technique and lots of experience. M.epi is not just cutting out some specific part of your eyes. It’s purpose is to make the make condition of your eyes by releasing the tensions step by step untill your eye is close to your ideal. So since Magic epicanthoplasty is such a delicate operation this takes around an hour and can even take more than 1hour and a half.